Sussex County Councilman Rob Arlett speaks with veterans and other audience members at Selbyville Town Hall on Tuesday, July 10. 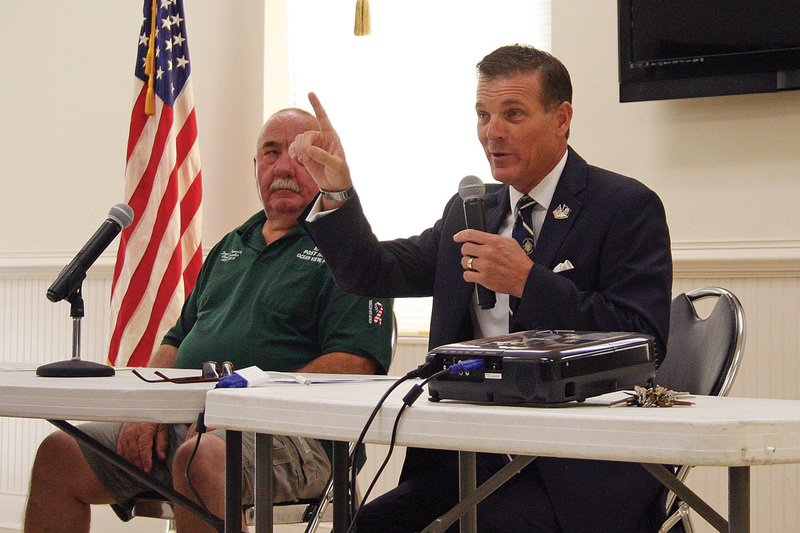 The free veterans town hall-style meeting was hosted and moderated by outgoing Sussex County Councilman Rob Arlett, who is running for U.S. Senate. “We are the problem. The elected officials are the problem, and we need to listen more to you and not think we have all the answers,” Arlett said. Roughly half the audience was veterans, by show of hands. They raised many concerns and complaints, as Arlett prompted them to further explain their experience with the system. A former U.S. Naval Reservist, Arlett described his own brother’s tumultuous exit from the military to civilian life, as well as the next generation of his family members entering the military. The panel included Shawn Greener, a Navy vet, former New Castle County police officer, consultant on counter-terrorism and personal protection, a pastor and talk-show host. “You should know your elected officials,” Greener said, and should complain when something seems wrong, like the perceived underfunding of Delaware’s VA or related services. Dean Levering, commander at VFW Post 7234 at Ocean View, also encouraged vets to stay active, politically and socially. “Keep Washington on their toes; keep veterans a priority,” as funding has dropped over the years “It’s not just a bunch of old guys sitting around and drinking, although that happens, too,” he joked, then described the two dozen various charities and volunteer programs at Post 7234. State legislators Sen. Gerald Hocker (R-20th), Rep. Ron Gray (R-38th) and Rep. Rich Collins (R-41st) were also present. Hocker mentioned that two VA medical facilities in Millsboro and Seaford have been replaced with one in Georgetown. They also discussed topics including filling prescription medications. “A lot of people don’t know what’s coming to them because they don’t have a road map to get there,” Greener said. Ultimately, the biggest advice was to sign up for the VA, even if people don’t think they need the service. Eventually, they may benefit from those due benefits, the speakers said. Plus, there is power in numbers as the VA seeks funding each year. Delawareans can also find the Veterans Benefit Resource Guide online at https://veteransaffairs.delaware.gov/or by calling (302) 739-2792. As for marijuana, Delaware now allows cannabis for medical use. The legislature considered but recently rejected it for recreational use, although possession has been downgraded to roughly the equivalent of a traffic citation now. “As a society, we’ve come to embrace natural, organic stuff,” so why not shift that mindset to medicine? Arlett said. Although Arlett didn’t share his opinions on recreational use, he said he supported cannabis for medical use, based on his own observations of addiction in his family. “At the federal level, it’s not legal for vets through the VA. I think we should change that” to allow medicine and testing, Arlett said. Meanwhile, he strongly criticized the “unbelievable corruption that exists with pharmaceutical companies and the distribution process … and the elected officials. … It’s no longer healthcare. It’s business. For instance, he said, Congress OK’d rebates and “points” in the medical field, but Arlett said similar kickbacks would jeopardize his license as a real estate agent. “The president is considering changing that via executive order. I think it needs to come through Congress,” said Arlett, who has opined that more laws should be enacted as such. Arlett has also proposed “that we bring the VA back under the umbrella of the Department of Defense. Although the VA is currently a standalone cabinet-level agency with its own budget, Arlett said he feels it would be less of an “afterthought” if brought back under the Department of Defense umbrella. Perhaps that could simply be in the form of recordkeeping for the vets, who have complained of the long waiting period for their records. Arlett has also proposed a mentoring program to help vets assimilate back into civilian life. Soldiers are strong and proud people who don’t like asking for help, but who have also spent a career working under a commanding officer. With a mentor to help them ease into civilian life, veterans would have a support system and the “quasi-chain-of-command” they’ve come to expect. Arlett suggested the local delegation raise the issue next legislative session (Collins and Gray are currently up for reelection this fall). Although he called the July 10 event a non-political one, Arlett’s U.S. Senate campaign was one of the event sponsors, and Arlett is planning a series of town hall events statewide, of which this was one. And although Larence Kirby (executive director of the Delaware Commission of Veterans Affairs) had originally intended to serve on the panel, he canceled the night before, on the same day Arlett officially filed for the Senate election as a Republican. In the Senate race, Republican Gene Truono Jr. has officially filed for Senate, as did Californian Roque “Rocky” De La Fuente (who has also filed in at least five other states, in an effort, he has said, to demonstrate the vagueness of the U.S. Constitution’s candidacy laws). Candidates for the Delaware Senate seat also include Democrats Tom Carper (the incumbent) and Kerri Harris, as well as Libertarian Nadine Frost and the Green Party’s Demitri Theodoropoulos. Arlett did not file for reelection to the Sussex County Council.